Taking steps to secure your home is a prudent step in a risky world. We might like to think we can fully trust our neighborhood but reality suggests that might not be the case. So, what can you do? Installing and using a reliable burglary and fire alarm solution is a great start. But there are also things you can do right now with little investment. Is your mail secure? Consider a lockable model, especially if you have bills and bank statements mailed to your home and you are generally away for the bulk of the day. Windows and doors? If these are easily accessible, consider placing dowels in your window tracks and sliding doors. Perhaps invest in secondary locks, or gated doors. 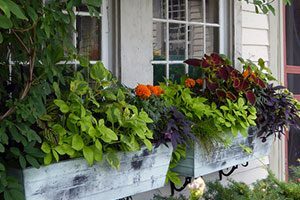 Make your windows less accessible with planter boxes or shrubbery. Make a routine of checking doors and windows each night before bed and again each morning before leaving home. Can’t afford it? If you can’t afford a real security system, fake it. You can buy signs for your front lawn and decals for your windows from online retailers. It will look like you’ve got the real thing and if that’s all you can afford, it’s a better deterrent than nothing. Same goes for fake security cameras, beware of dog signs, or pre-recorded dog-barking gadgets. Anyone home? Make it look like someone is always at home by keeping lights lit, running the radio or TV, and making sure mail or packages don’t stack up if you’re travelling. Speaking of travelling, don’t share your travel plans on social media. Nothing says “come by and rob me” like a “leaving for Hawaii today” post. As old-fashioned as it sounds, our neighbors can be our best asset to knowing what’s going on at home while we’re somewhere else. Your neighbors might work from home, have flexible hours or be in and out with school children. They can help keep an eye on your home and your neighborhood in general. In the spirit of being a good neighbor, find a way to return the favor in some way that benefits them. Fire alarms working? Fire alarm batteries should be tested quarterly and replaced annually. Be sure the alarms are in good working order, are placed in the optimal areas (like kitchen, each floor and each room). The alarms themselves should be replaced every 8-10 years. Don’t forget about carbon monoxide alarms either, which can protect from silent killer gasses emitted from fuel-burning appliances like stoves, clothes dryers or water heaters. Baby in the home? If you have a baby in the home, including visiting grand children or friends’ children, be sure your home is child proof. A safe environment includes cords and electrical plugs, secure book cases or climbing hazards, child-proof cabinets or safe storage for cleaning chemicals and medications. Safe lighting or tripping hazards? Those who are elderly, infirm or young children can easily trip on poorly lit stairs, pathways, or porches. Install foot-level lighting for safety. Are you secure online? Our cell phones, computers, tablets and TVs are all connected to the internet. Be sure your internet connections are secure. Protect your passwords and personal information. Turn off your device cameras or use webcam covers. Teach your children to be smart internet users to protect them from online predators. Prepared for an emergency? Have a well-stocked first-aid kit on hand for that unforeseen emergency. Be sure to have a fire extinguisher available in a logical location in your home like the kitchen, pantry or garage. Do you have local emergency phone numbers (other than 911) on your refrigerator or near the phone? Consider having a natural disasters emergency kit on-hand, stocked with canned food, water, dry clothes, batteries, radio, flashlight, contact numbers, etc. Discuss and practice emergency response with your family in the case of fire, flood, or other typical events. Invest in these small things now to keep you home safe and secure. And when your budget allows, invest in a reliable home security system to protect your family and your valuables 24/7. Is your commercial security state-of-the-art?